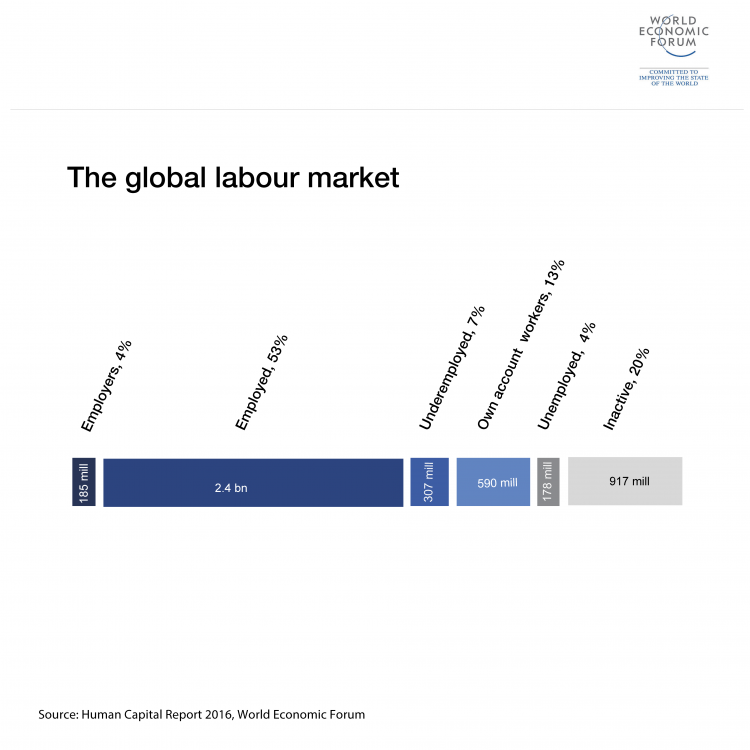 This week, the World Economic Forum published its annual Human Capital Report, which combines public stats, qualitative perception data, and big data to provide a more comprehensive picture of the global workforce. Data from the Economic Graph - a LinkedIn project to build a digital map of the global economy - is featured throughout the report. The bottom line here is that innovation is occurring at an unprecedented rate. That, in turn, is causing employers’ needs to shift rapidly. Education systems are struggling to keep pace, generating gaps in nearly every country and industry between the skills workers have, and the skills employers need. But despite all this swift change, we continue to measure workforce supply and demand in an archaic manner - via the supply and demand of job titles. This method isn’t ideal because job titles can mean different things in different industries and geographies. At LinkedIn, we view job titles as an agglomeration of skills (for example, a journalist’s skills include writing, editing, communication, and critical thinking, to name a few), and we believe the best way to measure workforce supply and demand is by analyzing workers’ skills and the skills needed to qualify for open jobs. In the Human Capital Report, we provide several examples that illustrate the insights that are are uncovered when you analyze supply and demand of skills, rather than job titles. To see them all, you’ll have to check out the report. But in this blog post, I’ll drill down on one particularly interesting example. About 45,000 companies across the globe, and hundreds of thousands of recruiters, use LinkedIn to hire. Lots of them have told us they’re struggling to find candidates with certain skills. As a co-founder of LinkedIn, I know well that when a company struggles to fill a role, its productivity drops. It’s interesting to see what happens, though, when employers look beyond job titles, and instead search for candidates who have skills related to the skill they need. For example, employers and countries often say there’s a low supply of workers with the job titles Data Analyst or Data Scientist. So let’s say I’m a recruiter searching for a Data Analyst or Data Scientist. About 84,000 of our more than 433 million members have the job titles Data Analyst or Data Scientist listed on their profiles. That’s a relatively small talent pool. 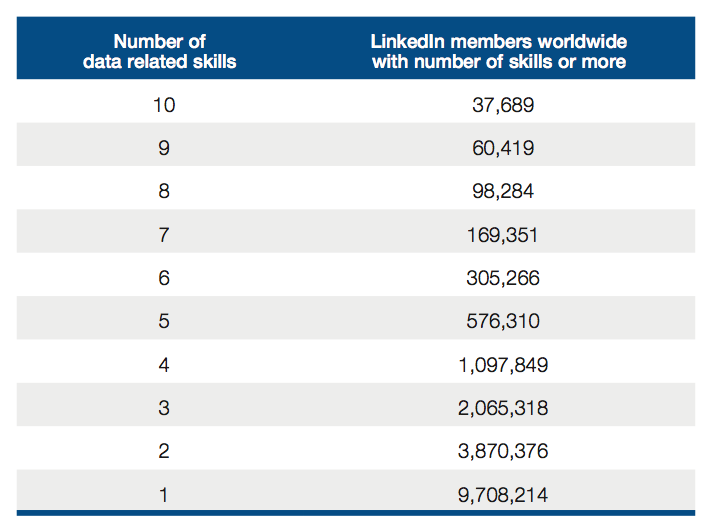 But consider this: nearly 10 million members have one or more of the skills needed to be a Data Analyst or Data Scientist. And 600,000 of those nearly 10 million members have five or more of the skills needed to be a Data Analyst or Data Scientist. Now, having a couple of data-related skills doesn’t make you a Data Analyst or a Data Scientist. But it’s likely that a large percentage of those 600,000 members could quickly learn the additional skills they need to become Data Analysts or Data Scientists. That’s exciting for two reasons: first, it could immediately broaden the pool of talent available to employers. And second, it could help prevent workers whose jobs could be left behind by the Fourth Industrial Revolution from becoming unemployed. This is just one of the examples we provide in the Human Capital Report. Our EMEA VP and Managing Director John Herlihy looks at how the same argument applies in the case of technical skills, in a post published today. Our vision is to create economic opportunity for every member of the global workforce, so we welcome ideas on how we can partner with governments, NGOs, and other stakeholders to provide transparency and insights into labor markets around the world.